Okay, in the interest of accuracy, this post should be titled “Insects, Insects, and more Insects.” That just doesn’t have the same ring to it though, does it? Anyway, if you haven’t noticed, we seem to have a bumper crop of insects this year, and they are all over the place! Nothing seems to be immune! 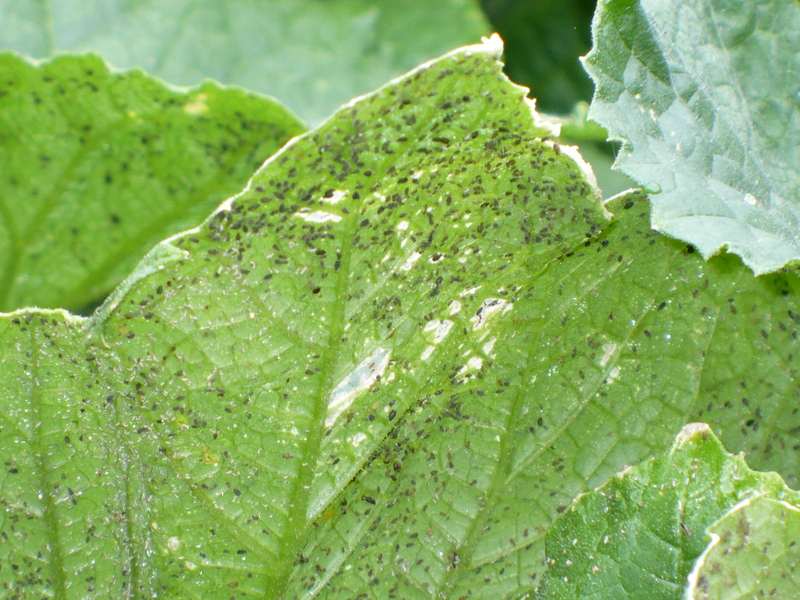 I turned over a cucumber leaf yesterday to find this sight…thousands of little black aphids coating the leaf! There were aphids everywhere. With this population of aphids, we decided to go straight to the “big guns” for insecticides and pulled out the permethrin. Neem oil would barely make a dent in this population of aphids! There seems to be another generation of cabbage loopers on the Brussels Sprouts, so they got sprayed as well. 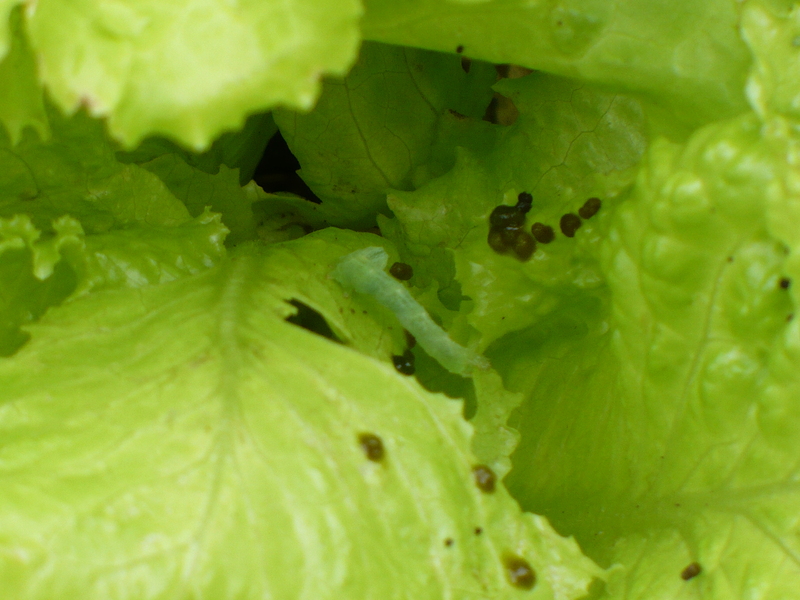 As if that wasn’t enough, we have some friendly caterpillars enjoying our summer lettuce crop as well. As you can see from all the frass, they’ve really been enjoying our lettuce. Then I go over to prune back the black raspberries a little bit, and what do I find? 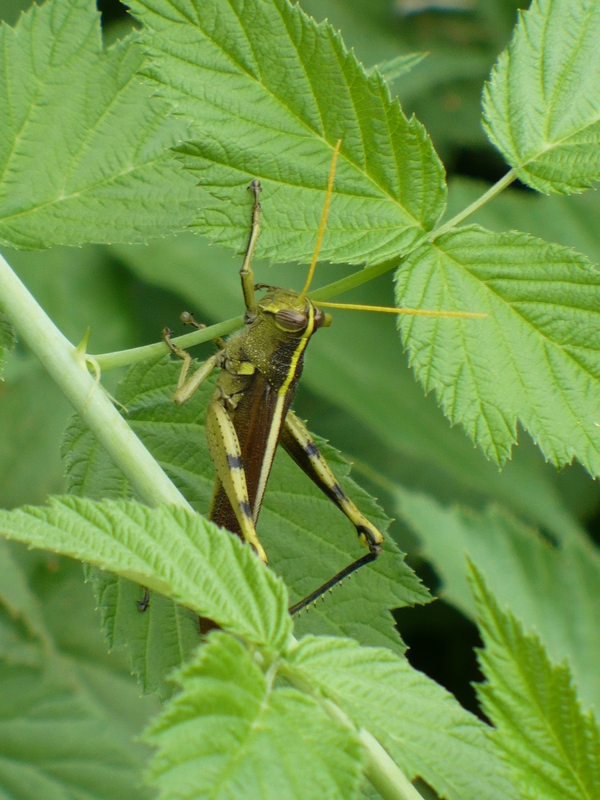 That’s right, a big grasshopper! Luckily, I only saw the one grasshopper, so I’m not too concerned. Hopefully he won’t bring a bunch of his friends along to the garden next time! Posted on July 29, 2009, in Insects Abound! and tagged Brussels Sprouts, cucumbers, insect problems, salad greens. Bookmark the permalink. 1 Comment.